Things started with a bang on the auxiliary field in game one this morning as the Palm Springs Chill defeated the Toronto Rush by a score of 13-4. The Rush struck early when Jesse Russo drilled a two-run home run in the bottom of the first inning, his first of the season. The Chill had an immediate answer, however, when they batted through the order and recorded five hits and two walks to make it 6-2, taking a lead that they would never relinquish. The Chill plated two more runs in the fifth inning and rounded out the scoring on a bases-loaded double by Corey Dempster in the top of the seventh. Daniel Goss, Nico Garbella, Nicholas Mira, and Dempster all had two hits for the Chill, who improved to 6-2 on the season. Tyler Cowles had a double and scored a run for the Rush, whose record slipped to 5-3 after the loss. The first game at Palm Springs Stadium was a pitchers duel ending with the Alberta Grizzly beating the Oregon Lumberjacks 2-0. Winning pitcher Noah Gotsis sat down the first nine batters for the Lumberjacks including seven straight strikeouts swinging. He would continue his pace not giving up a hit until the fifth inning with a one-out single to Trevor Westmoreland. The Grizzly scored their two runs in the first two innings from an RBI single from Wesley Brown and a single from Luke Bolka. Jonathon Howard took the loss for the Lumberjacks giving up two runs (one earned) over four innings. The script was flipped during the second auxiliary field contest when a low-scoring affair saw the Canada A’s emerge as 2-1 victors over the British Columbia Bombers in walk-off fashion. Travis McQueen hurled a masterpiece for the Bombers, striking out eight men and only allowing four batters to reach base the entire game, but it was all for naught as the A’s made the most of their limited offense. Matt Holliday led off the seventh inning with a double for the A’s, then speedy pinch runner Mike Blackwood-Kirby advanced on Joshua Henderson’s fielder’s choice and later scored on Derek Bangert’s deep sacrifice fly to right field. A’s starting pitcher Bryce Foster combined with relievers Dominic Pestello, William Nix, and Andrew Chin to limit the Bombers to just six hits while striking out six batters. In the second game at the stadium, the Palm Springs Power ended their stadium winless streak beating the Manitoba North stars 6-5. Manitoba struck first when Ethan Gofstein scored from an RBI single from Trey Bridis in the first. The Power would come back in the third tying the game after an RBI single and took the lead in the fourth from an infield single from Aaron Bailey. The Power blew the game wide open in the fifth scoring three runs sending seven batters to the dish. Manitoba would cut the lead to three after a solo home run from Bridis. The North Stars came alive in the seventh against Kyle Brown who tried to get the save for the Power. Manitoba immediately loaded the bases and scored two runs before Power manager Casey Dill sent out Mathew Jeffrey who gave up one run and ended the inning tied at five. Lamar Briggs led off the bottom of the seventh reaching on an error then would steal second and advance to third on a wild pitch. Pitcher Thomas Wordell then committed a balk and let Briggs score from third giving the Power the win. Monday will be Locals Day, when Coachella Valley residents get $3 admission with a valid ID. 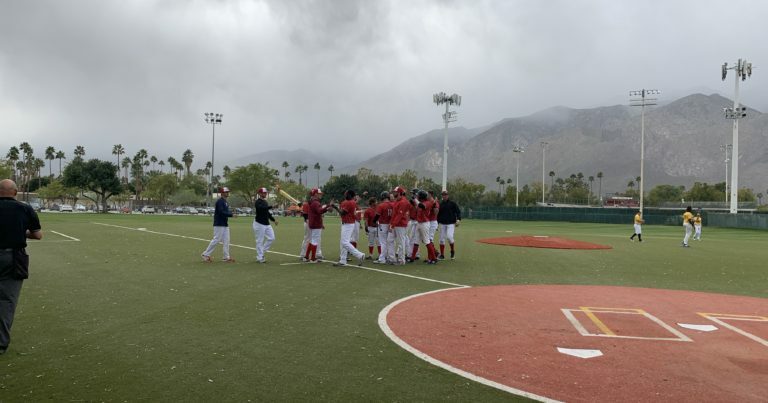 Game one at Palm Springs Stadium begins at 10:00 AM Pacific and pits the British Columbia Bombers against the New York Colonials, followed by the Canada A’s vs. the Palm Springs Chill at 12:30 PM.